The diamond core cuts faster, smoother and lasts longer than any other core drills. The diamond core drill bit must be used with water at all times when drilling. The water serves as a coolant to prevent the diamonds from overheating. The maximum allowable temperature for a diamond core bit is 500°C. There is no pilot drill with the diamond core bit. A low rpm rotary drill with a planetary gearbox is required to be used with a diamond core bit. It is possible to use a cordless drill, but in the lowest gear setting. No hammer action is used. Tightly fasten the diamond core bit in the drill's chuck. Keep the bit steady at a 45° angle with the starting point on the edge of the assigned area to be drilled whilst the bit is rotating. A notch will be made (this is normal). Gradually move the drill from 45° to 90° and continue drilling until finished. Allow the diamond core bit to cool down completely before proceeding to drill another hole. attaching a water feed device. This is necessary when drilling into a wall tile. Please have a look at the video in the tabs above showing how to use the diamond core bit. IMPORTANT:The tool life will mostly depend on the proper usage and the hardness of the items drilled into. 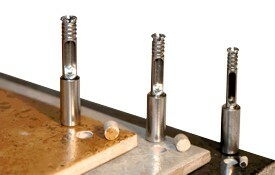 It is normal for a diamond core bit to last up to 10 or more drilled holes in hard tiles. Please remember to always use water when drilling with diamond core bits.